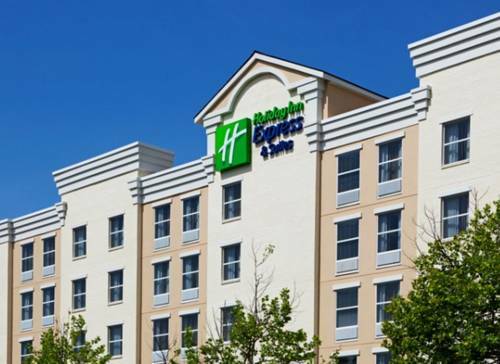 Huntersville, NC Hotel's Near Lake Norman Welcome to the Holiday Inn Express & Suites Huntersville Birkdale hotel, located in the beautiful Lake Norman area. The hotel's picturesque surroundings, spacious accommodations and quick access to area businesses and Birkdale Village make us a top pick for guests lodging in Huntersville. Our hotel's business guests appreciate the fact that we're conveniently located just off Interstate 77 and only minutes from nearby companies such as Ingersoll Rand, Newell Rubbermaid and McGuire Nuclear Station. With a 861sq ft meeting room that accommodates up to 65 guests, free high speed, wireless Internet access and a 24 hour Business Center, it's easy to see why we're preferred among Huntersville hotels. From spending the day shopping at Birkdale Village to soaking up the sun on Lake Norman, our hotel's leisure guests have an array of popular activities and attractions at their fingertips. And with a location just north of Charlotte, the NASCAR Hall of Fame, Concord Mills Outlet Mall and the Charlotte Motor Speedway are just minutes away. Along with being a smoke free facility, our amenities, such as the well equipped Fitness Center and an outdoor pool, make your stay unforgettable. Additionally, the free and hot Express Start Breakfast Bar, with our signature cinnamon rolls, helps you start your day off the smart way. Enjoy a comfortable stay at our Huntersville hotel during your trip! Mickey and Mooch: American Cuisine. Unique, Very popular Local Restaurant , varied menu, with full bar Meals begin at approx 20.00 and up. Outside seating , overlooking water feature weather permitting. 131 Main: Full service restaurant. Menu prepared from all fresh ingredients daily. They do not even have a freezer on premises. Look for specials! Red Rocks Cafe: Located in Birkdale Village. Serves Lunch, Dinner, Late night dining and Sunday Brunch. Features American, contemporary cuisine with seafood, steaks and vegetarian offerings. Extensive wine list and seasonal outdoor dining. Fox and Hound Pub and Grille: Full Bar and Lounge in Birkdale Village also serving lunch and dinner. Outdoor seating in nice weather for people watching in New England Village setting. Serving everything from sandwiches and pizza to hot dinner entrees and desserts. Joe Gibbs RacingHome of the famous Joe Gibbs Racing Team! See the showroom of cars, the displays in the lobby including highlights of Joe Gibb's NFL coaching career at the Washington Redskins.